"Nebraska Bugeaters" redirects here. For the National Premier Soccer League team, see Nebraska Bugeaters FC. The Nebraska Cornhuskers football team represents the University of Nebraska–Lincoln. Among the 128 Division I-FBS teams, Nebraska is one of ten football programs to win 800 or more games. Nebraska has more victories against Power Five opponents than any other program, as well as the fifth most victories all-time, behind only Michigan, Ohio State, Texas, and Alabama. Two of Nebraska's national championship-winning teams, the 1971 and 1995 teams, are listed by many as the best college football teams of all time. Nebraska claims 46 conference championships and five national championships: 1970, 1971, 1994, 1995, and 1997. The titles in the 1990s marked the first time that a team won three national championships in four seasons since Notre Dame in 1946–49, and one of only three instances a team has won back-to-back consensus national titles. Nebraska has won nine other national championships that the school does not claim. They are the only school with five or more national championships to not have a loss in any of their title seasons. Nebraska has had five undefeated seasons in which they were not national champions: 1902, 1903, 1913, 1914, and 1915. Between 1912 and 1916, the Cornhuskers played 34 consecutive games without suffering a loss. Famous Cornhuskers include Heisman Trophy winners Johnny Rodgers, Mike Rozier, and Eric Crouch. Rodgers was inducted into the College Football Hall of Fame and was voted the Nebraska "Player of the Century" in 1999. Rozier, who holds the all-time NCAA record for yards per carry, was likewise inducted into the College Football Hall of Fame in 2006. Other Cornhusker players and coaches who are Hall of Famers include: Forrest Behm, Bob Brown, Guy Chamberlin, Sam Francis, Tommie Frazier, Rich Glover, Wayne Meylan, Bobby Reynolds, Dave Rimington, George Sauer, Will Shields, Clarence Swanson, Ed Weir, Grant Wistrom, and coaches Gomer Jones, Pete Elliott, Francis Schmidt, Dana X. Bible, Bob Devaney, Biff Jones, Tom Osborne, Eddie N. Robinson and Fielding H. Yost. Since June 11, 2010 the University of Nebraska has been a member of the Big Ten Conference, previously affiliated with the Big 12. They are grouped in the Big Ten West Division, along with Illinois, Iowa, Minnesota, Northwestern, Purdue, and Wisconsin. Nebraska football began its history as the "Old Gold Knights," which was quickly changed to "Bugeaters" in 1892. "Cornhuskers" first appeared in an 1893 school newspaper headline stating "We Have Met The Cornhuskers And They Are Ours," after a 20–18 upset victory over Iowa. "Cornhuskers," in this instance, was used to derogatorily refer to Iowa. In 1899, Nebraska State Journal writer Cy Sherman, who would later help create college football's AP Poll, became the first person to refer to Nebraska as the Cornhuskers; the name caught on quickly and was officially adopted the following year. Nebraska's first game was a 10–0 victory over the Omaha YMCA on Thanksgiving Day, November 27, 1890. The program got off to a strong start, suffering only one sub-.500 season in its first 28 years of competition. Prior to a one-win season in 1899 in A Edwin Branch's only year as head coach, Nebraska compiled a 40–18–3 (0.680) record. George Flippin was the first African-American athlete at Nebraska and only the fifth black athlete at any predominantly white university. Because of Flippin's presence on the roster, Missouri refused to play a scheduled game with Nebraska in 1892. The result was a 1–0 forfeit, and, technically, the first-ever conference win for Nebraska. Nebraska's fourth coach, Frank Crawford (1893–94, 9–4–1, 0.679) was the school's first paid football coach. Eddie N. Robinson (1896–1897, 11–4–1, 0.719) and Fielding H. Yost (1898, 8–3, 0.727), the program's sixth and seventh head coaches, were the earliest Nebraska coaches to be inducted into the College Football Hall of Fame. Walter C. Booth (1900–05, 46–8–1, 0.845) was Nebraska's ninth head coach, and had the second-best record during this era among multi-year coaches. His 1902 team went undefeated, untied, and unscored upon. Despite at one point leading his team on a 24-game winning streak, Booth was bested by Ewald O. Stiehm (1911–15, 35–2–3, 0.913), who won the MVIAA conference title in all five of his seasons and posted a school-record 34-game unbeaten streak. His .913 winning percentage remains the highest in school history. The Cornhuskers were a strong candidate play in the first-ever Rose Bowl Game after the 1915 season, but the university's athletic board voted to turn down any such invitation. Stiehm left NU after the 1915 season when the university turned down his demand that he be paid an annual salary of $4,250 to serve as football coach, basketball coach, and athletic director. When the United States became involved in World War I, many young men went off to war, depleting the ranks of football teams nationwide. In addition, travel was severely restricted, causing the cancellation of numerous scheduled games. The Spanish flu pandemic further complicated the 1918 college football season. William G. Kline led Nebraska through the stunted 1918 season, managing a 2–3–1 (0.417) record. Veteran head coach Henry Schulte (1919–20, 8–6–3, 0.559) took over for the next two seasons, but barely managed to maintain a winning record as the program recovered from the war and its aftermath. Although Schulte stepped down as head football coach after 1920, he remained at Nebraska in a variety of coaching roles through 1938. By the end of the post-war slump, Nebraska had been led by 15 head coaches over 31 years. However, a period of relative stability followed as Nebraska was able to once again be successful, this time with considerably less turnover. Fred Dawson (1921–24, 23–7–2, 0.750) arrived at Nebraska after stints at Columbia, Denver, and Virginia. During the entire three-year tenure of Knute Rockne's famed Four Horsemen, Notre Dame lost only two games; one each in 1922 and 1923, both to Nebraska in Lincoln. In Dawson's four years he won three conference titles and compiled the best record of any coach from this era, though several who followed him were also successful. First-time head coach Ernest E. Bearg (1925–28, 23–7–3, 0.742) won the conference title in his final season before handing over the team to Dana X. Bible (1929–36, 50–15–7, 0.743). Bible had an established reputation after fifteen years as a head coach, bringing in five Southwest Conference titles for Texas A&M, and his success continued as he led Nebraska to six more conference titles in eight seasons. While Biff Jones (1937–41, 28–14–4, 0.652) was not as successful as his predecessors, he still managed to win two conference titles in his tenure and brought Nebraska to their first bowl game, a 21–13 loss to Stanford in the 1941 Rose Bowl. The following year, as the United States was drawn closer to involvement in World War II, the program set an unfortunate record by losing five straight games for the first time. One week after the final game of the season, Japan attacked Pearl Harbor and, much like 20 years prior, Nebraska's fortunes headed downward as the country headed into war. Nebraska was led by three head coaches during the war years, which saw a scarcity of players available since most of the country's college-aged men were fighting abroad. By the time the war ended in 1945, the Cornhuskers had gone 11–24–0 (0.314) over the previous four seasons. Unlike the first time, Nebraska's situation did not improve after the war. Bernie Masterson (1946–47, 5–13, 0.278) recorded the school's worst-ever winning percentage in his first and only head football coaching appointment. Previous head coach George Clark (1945 & 1948, 6–13–0, 0.316), a veteran of both wars with an extensive coaching pedigree, returned for the 1948 season while a search was conducted for his successor. After the season, Clark became NU's athletic director, a position he held until 1953. Clark hired Bill Glassford (1949–55, 50–40–4, 0.553), whose up-and-down tenure included a 6–2–1 1950 season, and Nebraska's second-ever bowl appearance, a 34–7 loss to Duke in the 1955 Orange Bowl. Following Glassford was rookie head coach Pete Elliott, a former quarterback who led Michigan to the 1948 national championship. Elliott would later lead the Illinois Fighting Illini to a Rose Bowl win, but he went only 4–6 (0.400) in his one year at Nebraska. His replacement, Bill Jennings (1957–61, 15–34–1, 0.310), fared even worse in Lincoln, coaching the team for five seasons and not reaching .500 in any of them. Prior to 1941, Nebraska had an all-time .732 winning percentage, seventh-best in college football, behind only Yale, Princeton, Notre Dame, Harvard, Michigan and Minnesota. From 1941 to 1961, however, Nebraska had a winning percentage of .368, which ranked 126th out of 133 Division I teams, and was higher than only fellow Big Eight member Kansas State among major conference teams. Bob Devaney (1962–72, 101–20–2, 0.829) brought about an immediate turnaround in the fortunes of Nebraska football. He led Nebraska to a 9–2 record in his first season, which was capped by the school's first bowl win, against Miami in the 1962 Gotham Bowl. This was the first of 40 consecutive winning seasons for the Cornhuskers, and Nebraska's NCAA-record sellout streak began in the seventh game of 1962. After five straight seasons with a bowl appearance, Devaney's teams went 6–4 in both 1967 and 1968, prompting a major shift in the team's offensive philosophy. This shift mainly involved offensive assistant Tom Osborne and his now-famed I formation, an offense Nebraska would run for the next 35 years. Over the following four seasons, with Osborne installed as offensive coordinator, Nebraska suffered just four losses (42–4–2, 0.896), winning the conference title in each year and securing the program's first two claimed national championships. The Cornhuskers' 1970 team needed a bit of good fortune to claim the school's first national title. Nebraska entered the day of the Orange Bowl ranked third, but losses by no. 1 Texas and no. 2 Ohio State gave NU the championship after a 17–12 victory over LSU. There would be no such suspense in 1971, as Nebraska began the season ranked second, and quickly moved up to no. 1 after a 34–7 victory against Oregon in week one. The Cornhuskers remained atop the AP Poll for the rest of the season, which included a 35–31 Thanksgiving Day defeat of no. 2 Oklahoma, a game still referred to as the "Game of the Century". Nebraska wrapped up the title by beating Bear Bryant and Alabama 38–6 in the 1972 Orange Bowl on New Year's night. Nebraska's 1971 team remains the only champion ever to defeat the teams that finished second, third, and fourth (Oklahoma, Colorado, Alabama) in the final rankings. The program began producing All-Americans with regularity during Devaney's tenure. Among the 18 who received such recognition were Johnny Rodgers, who won the Heisman Trophy in 1972, and Rich Glover, who won the Outland Trophy and Lombardi Award that same season. Devaney stepped down after the 1972 season to become Nebraska's athletic director. Tom Osborne (1973–97, 255–49–3, 0.836) subsequently became Nebraska's longest-tenured coach, ending with the fourth-highest winning percentage in major college football history. Osborne never won fewer than nine games and secured 13 conference titles in his 25 seasons. An undefeated regular season earned the 1983 team— nicknamed "The Scoring Explosion"— a no. 1 ranking and a trip to the 1984 Orange Bowl. The heavily favored Cornhuskers immediately fell behind Miami, trailing 17–0 at the end of the first quarter. Early in the second quarter, Osborne called for the "fumblerooski," a trick play which had quarterback Turner Gill "fumble" the snap by intentionally setting the ball on the turf, where it was picked up by All-American guard Dean Steinkuhler, who ran 19 yards for a touchdown. Nebraska mounted a furious comeback, scoring a touchdown to get within one point with just seconds remaining. Overtime had not yet been brought to college football, so kicking the extra point meant the game would likely end in a tie and give the Cornhuskers the national title. However, Osborne elected to go for two and the win outright, and the conversion pass fell incomplete. Although this game is widely regarded as the earliest occurrence of the fumblerooski, Nebraska had actually tried the play twice before, both in a 17–14 loss to Oklahoma in 1979. After a controversial loss in the 1993 national championship game, Osborne finally won his first claimed national title in 1994, when no. 1 Nebraska beat no. 3 Miami 24–17 in the Orange Bowl. The Cornhuskers' 1995 team was even better, beating four teams that finished in the top ten and winning every game by at least 14 points. NU's 62–24 Fiesta Bowl demolition of Florida and future Heisman Trophy winner Danny Wuerffel was the biggest national championship blowout in college football history. Nebraska scored 53 points per game and allowed only 14. The 1994 and 1995 teams, which went a combined 25–0, along with Alabama (2011, 2012) are the only back-to-back national champions since Oklahoma in 1955 and 1956. In 1996, the Big Eight, which Nebraska had won five years in a row, merged with the Southwest to create the Big 12. Despite its similarity in name, the Big 12 was an entirely new conference and did not retain any of the Big Eight's history or records. After being shutout in week two by Arizona State, NU won ten straight games to make the first Big 12 Championship Game. However, the Cornhuskers missed out on a fourth straight national championship appearance when they were upset by Texas. In 1997, Nebraska quickly regained its status as a national contender with a 27–14 victory at no. 2 Washington in week three. A 45–38 overtime victory at Missouri kept the Huskers' title hopes alive. The comeback win was highlighted by the "Flea Kicker," a last-second, game-tying touchdown that bounced off the foot of intended receiver Shevin Wiggins and directly into the hands of Matt Davison. Nebraska returned to the conference championship game and beat Texas A&M for its first Big 12 title. A 42–17 victory over no. 3 Tennessee in the Orange Bowl boosted NU to the top of the Coaches Poll, making Osborne the only coach to retire following a national champion. Nebraska posted a 60–3 record in the final four years of Osborne's tenure. Upon Osborne's retirement, the program was handed over to coaching assistant Frank Solich (1998–2003, 58–18, 0.766), who had played at Nebraska under Bob Devaney from 1963–1965. In his six seasons, Solich won the 1999 Big 12 title and took the Cornhuskers to the 2001 national championship game. After going 7–7 season in 2002, the first non-winning season for Nebraska in 40 years, Solich made aggressive changes to his assistant coaching staff. The approach appeared fairly successful, as Solich's 2003 team went 9–3 in the regular season. However, second-year NU athletic director Steve Pederson fired Solich before the bowl game, justifying the move with the now-infamous claim that he would not "let Nebraska gravitate into mediocrity" or "surrender the Big 12 to Oklahoma and Texas". Solich's first-year defensive coordinator Bo Pelini was appointed interim head coach and led the Cornhuskers to a 17–3 win over Michigan State in the Alamo Bowl. Although Pelini interviewed for the position as permanent replacement, former Oakland Raiders coach Bill Callahan (2004–07, 27–22, 0.551) was named Solich's successor following a 40-day, one-man coaching search conducted by Pederson. Callahan's mandate to prevent Nebraska's decline was not immediately successful, as his NFL-style West Coast offense led to varying levels of success, including a 5–6 2004 season that was Nebraska's first losing season since 1961. Callahan's teams showed improvement in the following two years, at 8–4 in 2005 and 9–5 in 2006. However, in 2007, Nebraska dropped five straight games for the first time since 1958, including a record-setting 76–39 loss to Kansas. Pederson was fired as athletic director in the middle of the five-game slide, and Tom Osborne returned from his political career to fill in as interim athletic director. Callahan's fate proved to be the same as Perderson's, as he was fired by Osborne immediately after a season-ending 65–51 loss to Colorado. In four seasons, Callahan had accumulated the lowest winning percentage by a Nebraska head coach in 46 years. Osborne, now full-time athletic director, selected Bo Pelini (2008–14, 67–27, 0.713) to return to Nebraska as the program's 32nd head coach. Pelini's first team tied for the Big 12 North division title with a 9–4 record, the best record among all twenty-eight first-season coaches in the FBS. In 2009, Nebraska led the nation in scoring defense at 10.4 points per game, a remarkable turnaround for a unit that had been among the nation's worst just two years prior. NU finished 10–4 and ranked 14th. Following the 2009 season, Pelini was given his second raise and contract extension. In 2010, Nebraska again finished 10–4, with a third straight division championship and a #20 overall ranking. Nebraska's first season in the Big Ten Conference was moderately successful, finishing third in the Legends Division and 9–4 overall. In 2012 the Cornhuskers went undefeated at home for the first time since 2001 and won the Legends Division. However, they lost the Big Ten Championship game to unranked Wisconsin and the Capital One Bowl to no. 6 Georgia, ending the season with four losses yet again. 2013 saw Nebraska tie for second place in the Legends Division and wrap up a 9–4 season with a rematch win over no. 23 Georgia in the Gator Bowl. In 2014, the Cornhuskers went 9–3 in the regular season, but a continued pattern of bad losses led to Pelini being fired by athletic director Shawn Eichorst. At the time of the firing, the university reportedly still owed Pelini $7.65 million. Pelini left the program with a 67–27 record (.713), winning either nine of ten games each season; ironically, NU lost three games under Pelini in his final season, the only time he did not lose exactly four games. Shortly after, Nebraska hired Oregon State's Mike Riley as its new head coach. The Cornhuskers ended 2014 under interim coach Barney Cotton, losing to no. 24 USC in the Holiday Bowl and finishing at 9–4, marking Nebraska's seventh consecutive four-loss season. Mike Riley (2015–17, 19–19, 0.500) finished his first season at Nebraska 6–7 with a victory over UCLA in the Foster Farms Bowl. Riley's second season proved to be more successful, as the Cornhuskers started 7-0 and worked their way into the national top five for the first time since 2010. However, subsequent losses to Wisconsin, Ohio State, Iowa, and Tennessee, meant NU finished with a 9–4 record and outside of the top 25. In Riley's third year, Nebraska suffered its worst season in 56 years with a record of 4–8. University chancellor Ronnie Green fired athletic director Shawn Eichorst in September after a home loss to Northern Illinois and subsequently appointed former Husker player Dave Rimington as interim AD. Bill Moos was hired as athletic director in October and then terminated Riley the day after the season ended. Riley finished his three-year career at Nebraska with a 19-19 record and was 12-14 in conference play. On December 2, 2017, Nebraska hired alumnus Scott Frost from UCF as its 33rd head football coach. Bo Pelini served as interim head coach for the bowl game in the 2003 season after Frank Solich was fired. For recruiting purposes, Athletic Director Tom Osborne appointed himself interim head coach following the firing of Bill Callahan. Barney Cotton served as interim head coach for the bowl game in the 2014 season after Bo Pelini was fired. Trent Bray served briefly as interim head coach after the firing of Mike Riley in 2017. Nebraska has been awarded nine other national championships by various polling organizations that the school does not claim. ‡ Both Nebraska :206 and Oklahoma claim the 1972 championship due to a dispute over Oklahoma forfeiting games. Nebraska claims 10 division championships in two conferences through the 2017 season. Nebraska has played in 53 bowl games, including an NCAA-record 35 straight from 1969 to 2003, with a record of 26–27. Nebraska has worn traditional uniforms throughout its history. The first helmet was red with a single white stripe. This was later changed to a plain white helmet with a black number on the side. From 1967 to 1969, a red, offset "NU" was placed on each side of the helmet. In 1970, the "NU" was changed to the now-familiar single "N," a design that is still in use, although it is thought a few "NU" helmets remained in use as late as 1972. The change was necessitated due to a shortage of "U" stickers, and when the program won its first claimed national championship that season, the single N remained. The helmet design has remained essentially unchanged since, with the exception of the facemask, which was changed from grey to red prior to the 1982 Orange Bowl against Clemson. The jerseys have only been altered a few times, with the addition of shoulder stripes and numbers. In the late 1960s and early 1970s, the Huskers wore full shoulder stripes reminiscent of those worn by the Baltimore Colts of the NFL. These were gradually phased out when mesh and tearaway jerseys became popular. NU's jerseys had a script "Nebraska" embroidered onto the front for the 1974 Cotton Bowl Classic, but this change was for the bowl game only. From 1980 to 1983, Nebraska's jerseys featured only a simple block "N" on the sleeves. In 1984, two sleeve stripes and sleeve numbers were added back to the uniform, where they remain, although the stripes and numbers have decreased in size as jersey sleeves have shortened over the years. 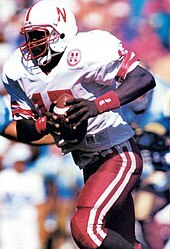 Shoulder patches were added to the jerseys in 1989, with a patch commemorating the 100th season of Nebraska football. The following season, a similar patch reading "Nebraska Football: A Winning Tradition" was added to the front of the left shoulder of the jersey. In 1999 a new version of this patch debuted and it has remained there to date. Players' last names began appearing on the backs of the jerseys for bowl games only in the 1970s. Around 1980, names were added to road jerseys as well. The home jerseys remained nameless; the only exception allowed for seniors to have their name on their jersey for the last home game of the year. This explains why footage of many Oklahoma-Nebraska games played in Lincoln during this era feature some Nebraska players with names on their jerseys and some without. From 1990 onward, names were permanently affixed to the home jersey. The team traditionally wears white pants at home and red on the road, although there have been exceptions. Nebraska donned red pants with red jerseys for the first time in school history for its 1986 contest with Oklahoma. Nebraska led this game for 58 minutes before losing a 20–17 heart-breaker, and so the red-on-red combination was deemed unlucky. Nebraska began periodically donning all white uniforms, beginning with the 1991 Florida Citrus Bowl against Georgia Tech, a 45–21 loss. NU next tried the white-on-white combination for its first three road games in 1992, but dropped two of them, including an embarrassing 19–10 decision to unranked Iowa State. The "surrender suits," as they had been termed by then, were not used again until 2002 (see next paragraph) and then 2007, when they were worn for Bill Callahan's last game as head coach, an embarrassing 65–51 loss to Colorado. In 2014, Nebraska donned all-white uniforms again when they played at Fresno State, as the Bulldogs were wearing all red. NU won 55–19 and proceeded to wear the uniforms for three more games that season, victories over Northwestern and UCLA, and a loss to Wisconsin. From 1968 through 1994, the pants had two stripes down each side. Originally they were thin stripes, but they became thicker in the mid-1970s. These were removed prior to the 1995 season, and the pants remained stripe-less until 2001. For the 2002 season, Nebraska experimented with side panels on its jersey and pants, and went to all white permanently on the road. The look was incredibly unpopular among fans, largely because the Huskers went 7–7, their worst season in 40 years. In 2003, Nebraska returned to a look similar to the one they wore before 2002. In 2004, the two pant stripes returned to the uniform, where they remain. On September 26, 2009, for the first time in school history, the Cornhuskers wore "throwback" uniforms in honor of Nebraska's 300th consecutive sellout. In the 2010 season, the numbers on the outside of the shoulder were placed on the top of the shoulder pads, similar to the style of the late 1970s. 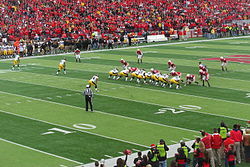 The Huskers wore all-red alternate uniforms with black helmets against Wisconsin on September 29, 2012. This marked the first Adidas Unrivaled Game, though the designs for both teams proved to be hugely unpopular. Nebraska wore alternate uniforms against UCLA in 2013. This uniform marked the introduction of Adidas’ TECHFIT ShockWeb technology. The black jersey featured white stencil font numbers, a white matte helmet with a wide black stripe, and a face mask that faded from red to matte black. Since 2012, Nebraska has sported an alternate uniforms in some capacity in each season. Against Illinois in 2014, Nebraska wore an all-red uniform featuring black metallic stripes on the jersey and pants. In 2015 and 2016 respectively, NU wore a black uniform and a white uniform that featured a similar basic design and chrome elements from the 2014 alternates. In 2017, Nebraska wore throwback uniforms to celebrate to 20th anniversary of the school's 1997 national championship team. Unlike most previous alternate designs, this one was incredibly well received by fans. Adidas has been the official shoe and uniform sponsor of Nebraska since 1996. Memorial Stadium, home of the Cornhuskers since 1923 and the location of an ongoing NCAA-record 368 game sellout streak, provides one of the most exciting game-day experiences in all of college football. The "Sea of Red," as it is known, becomes the "third-largest city in Nebraska" on game days, as its capacity exceeds that of every Nebraska town except for Omaha and Lincoln. The sellout streak dates back to November 3, 1962, during Bob Devaney's first season at Nebraska. The first game in the streak was a 16–7 loss to Missouri with 36,501 in attendance. The streak reached 300 games with a win over Louisiana–Lafayette in front of a then school-record crowd of 86,304 on September 26, 2009. The stadium completed a major expansion to its east side in 2013, bringing the official capacity to 85,458, though crowds regularly exceed 90,000. 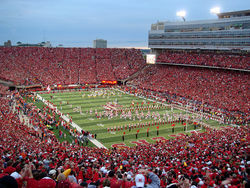 Nebraska played in front of the largest crowd in Memorial Stadium history on September 20, 2014 against Miami, with an announced attendance of 91,585. Three statues sit outside of the stadium. The oldest statue is the Husker Legacy Statue, which was unveiled in 1997. It depicts six Nebraska defensive players tackling a Kansas State player and was modeled after a picture taken during the NU's game against the Wildcats in 1995. It is made of bronze and weighs two tons. Fred Hoppe, the creator, said that "the monument displays the sense of pride that Nebraskans have for their football team." In 2006, Hoppe created Memorial Stadium's second statue, which depicts Tom Osborne and quarterback Brook Berringer and is located outside of the Osborne Athletic Complex on the north side of the stadium. It is a life-sized bronze sculpture of the two standing side-by-side. On August 30, 2013, a life-sized bronze statue of Bob Devaney was unveiled at the main entrance of the newly remodeled east stadium. The sculptor, Joe Putjenter, also sculpted the Tunnel Walk gates inside of the stadium. Prior to Memorial Stadium, the Huskers played their home games at Nebraska Field, from 1909 to 1922. They defeated Notre Dame's famed Four Horsemen in the final game at the stadium. At every home game since the 1940s, fans have released thousands of helium balloons when the Huskers score their first touchdown. In 2012, a global helium shortage nearly ended the tradition, but after reviewing the amount of available helium, the university allowed a limited number of balloon releases throughout the season. The tradition returned to normal the following year. NU's defense has gone by the name "Blackshirts" since the 1960s, a reference to the black jerseys worn by starting defensive players during practice. Depictions of the Blackshirts often include a skull and crossbones. The tradition originated when Bob Devaney had assistant coach Mike Corgan find contrasting jerseys to offset the red jerseys worn by the offense in practice. Further credit is given to George Kelly, Devaney's defensive line coach until 1968, who frequently referred to the top defensive unit by the name; eventually the rest of the coaching staff caught on. Just before the Tunnel Walk, the west side of Memorial Stadium yells "Husker" in unison, while the east side responds with "Power"
Since 1994, Nebraska's home games have opened with the Tunnel Walk. Before NU takes the field, Memorial Stadium's video boards light up with a custom video, and "Sirius" blares from the speakers as the Huskers take the field. Nebraska football has a long-standing walk-on program, which attracts many student-athletes from throughout the state that the Cornhuskers did not offer athletic scholarships to. NU accepted its first walk-on player in the early 1960s, and Tom Osborne began an official walk-on program in 1973 after the NCAA reduced the number of scholarships the university could offer. The size of the program means that Nebraska's rosters are unusually large; NU had 141 players on the team that won the 1996 Fiesta Bowl, while opponent Florida had only 94. About 40% of the players that traveled to away games under Osborne were walk-ons. He credited them with contributing to his teams' success by providing manpower to better scout future opponents. Unlike many other schools, Nebraska's walk-ons have the same access to training facilities and academic counseling as those with scholarships. While many walk-ons never play in a game, six walk-ons have become All-Americans and 29 have played in the NFL. Twelve have been named Academic All-Americans. The rivalry between Nebraska and Colorado is often considered one-sided. The teams have met 70 times, with the series dating back to 1898, a 23–10 Nebraska win. The rivalry gained traction when Colorado joined the Big Eight in 1947; they would play in the same conference as Nebraska until 2010. For a brief period of time (1951–61), a buffalo head named Mr. Chip was presented to the winning team, but this exchange ended when Colorado misplaced the trophy. Since Nebraska's move to the Big Ten in 2011, the series has been dormant. Future non-conference games are planned for 2018, 2019, 2023, and 2024. The Cornhuskers lead the series 49–19–2 as of 2018. The Heroes Trophy has been awarded to the winner of the Iowa–Nebraska game since the 2011 season. "The Heroes Game," as it is known, takes place on Black Friday and is the last game of the regular season. The teams have met 49 times, with the series dating back to 1891, with a 22–0 Iowa win. The Cornhuskers lead the overall series 29–17—3, however Iowa leads the trophy series 5–3. Iowa is the most recent Heroes Trophy winner, having defeated the Cornhuskers in 2018. The teams play annually and will meet next on November 29, 2019, at Memorial Stadium. The $5 Bits of Broken Chair Trophy has been awarded to the winner of the Minnesota–Nebraska game since the 2014 season. The teams have met 56 times, dating back to 1900, a 20–12 Minnesota win. The Golden Gophers lead the series 31–24–2. Nebraska currently holds the trophy, having defeated the Gophers in 2017. The teams play annually and will meet next on October 20, 2018, at Memorial Stadium. The Victory Bell (also known as the Missouri–Nebraska Bell) has been awarded to the winner of the Missouri–Nebraska game since the 1927 season. The teams have met 104 times, with the series dating back to 1892, a 1–0 NU win when Missouri forfeited to protest the presence of African-American George Flippin on Nebraska's roster. The Cornhuskers lead the series 65–36–3. Nebraska currently holds the Victory Bell, having defeated the Tigers in 2010. With Nebraska's move to the Big Ten in 2011, the series currently lies dormant. No future games have been scheduled. The Freedom Trophy has been awarded to the winner of the Nebraska–Wisconsin game since the 2014 season. The teams have met thirteen times, with the series dating back to 1901, an 18–0 Wisconsin win. The Badgers lead the series, 9-4. Wisconsin currently holds the Freedom Trophy, having defeated the Cornhuskers 41-24 in 2018. The teams play annually and will meet next on November 16, 2019 at Memorial Stadium. Nebraska and Oklahoma has long been considered one of the great college football rivalries. The teams have met 86 times, dating back to 1912, a 13–9 Nebraska win. The Sooners lead the series, 45–38–3. Since Nebraska's move to the Big Ten Conference in 2011, the series has been dormant. Future non-conference games are scheduled 2021, 2022, 2029, and 2030. Notably, the 2021 game in Norman will mark the 50th anniversary of no. 1 Nebraska's 35–31 victory over no. 2 Oklahoma in the "Game of the Century". The series began on November 23, 1912 in Lincoln with 13–9 Cornhuskers victory. Nebraska dominated the series until 1942, going 16–3–3 in the first 22 meetings. The Sooners then ran off 16 consecutive victories, the longest streak in the series. The Sooners won nearly all of these games by substantial margins; only the 1947 and 1950 matches were competitive. The streak ended in 1959 when unranked Nebraska upset no. 19 Oklahoma 25–21. In addition to ending the Cornhuskers' drought against the Sooners, this victory snapped Oklahoma's remarkable 74-game win streak against conference opponents. Through the 1960s and early 1970s, the two teams traded wins and losses, with each team going 6–6. From 1972 to 1977, Oklahoma went on a six-game win streak, which ended in 1978, when no. 4 Nebraska upset no. 1 Oklahoma 24–21. Less than two months later, OU won a rematch in the Orange Bowl. Throughout the 1980s, the series was evenly split, with each team going 5–5. In 1990, unranked Oklahoma shocked no. 10 Nebraska 45–10. The rest of the decade, however, was dominated by Nebraska, as the Cornhuskers went on a seven-game win streak, outscoring Oklahoma by a combined margin of 265–61. This includes NU's 69-7 victory in 1997, the largest margin of victory in series history. With the merger of the Big Eight and Southwest Conference in 1996, the schools were no longer scheduled to play on an annual basis, though the first season they did not meet was 1998. As Big Eight opponents, Nebraska and Oklahoma had played for 68 consecutive years, a streak that began in 1928. However, the Big 12's two-division structure had Nebraska in the North and Oklahoma in the South, and did not feature any protected cross-division rivalry games. From 2000 to 2009, the schools met seven times, with the Sooners going 5–2. The two teams met for the last time as conference opponents in the 2010 Big 12 Championship Game, in which no. 9 Oklahoma defeated no. 13 Nebraska 23–20. Historically, the two teams regularly competed against each other for conference championships. Over the Big 8 Conference's 89-year history (1907–1995), Nebraska and Oklahoma combined to win 74 conference titles, 41 by the Cornhuskers and 33 by the Sooners. During the years of the Big 12 Conference Championship Game (1996–2010), the two teams combined for an additional nine conference titles, seven by Oklahoma and two by Nebraska. Of the Sooners' seven titles in this era, two were won against the Cornhuskers. The Nebraska-Oklahoma game often showcased the highest level of college football. In eighteen of the matches, both teams held top ten rankings in the AP Poll; in nine of these games, both teams held top five rankings. The 1971 and 1987 matchups featured teams ranked no. 1 and no. 2. The rivalry's greatest moment was likely the 1971 game, when no. 1 Nebraska squared off with no. 2 Oklahoma on Thanksgiving Day in Norman. The game aired on ABC, with an estimated 55 million viewers. Deemed the "Game of the Century," this game highlighted the skills of Nebraska Heisman Trophy winner Johnny Rodgers and Oklahoma All American Jack Mildren, among many other standout players. The game, evenly matched in practically every aspect, ended with a 35–31 Cornhuskers victory, and Rodgers' first-quarter punt return touchdown is still considered one of the greatest plays in college football history. Following the game Dave Kindred of The Courier-Journal wrote, "They can quit playing now, they have played the perfect game." Over the years, the rivalry has produced several upsets. On sixteen occasions, the lower-ranked team won the game. NU's 25–21 upset of top-ranked OU in 1959 is one of the biggest upsets in program history. On four occasions, the no. 1 team in the country lost the matchup: 1978, 1984, 1987, and 2000. The most recent upset in the series occurred in 2009 when unranked Nebraska shut down no. 20 Oklahoma's high-powered offense in a 10–3 win. Nebraska and Kansas share a natural border rivalry and maintained the longest non-interrupted rivalry in college football history at 105 years. The teams have met 117 times, with the series dating back to 1892, a 12–0 Kansas win. The Cornhuskers lead the series 91-23-3, which includes 36 consecutive victories from 1969 to 2004. Since Nebraska's move to the Big Ten in 2011, the series has been dormant. No future games are scheduled. Nebraska and Kansas State were conference rivals from 1913 to 2010. With only 135 miles separating the schools, they were the nearest cross-border rivals in the Big Eight and Big 12 conferences. The teams have met 95 times, with the series dating back to 1911, a 59–0 Nebraska win. Nebraska leads the series 78–15–2, which includes 29 consecutive victories from 1969 to 1998. Since Nebraska's move to the Big Ten in 2011, the series has been dormant and no future games are scheduled. In 1998, no. 1 Kansas State won a controversial 40–30 thriller over no. 10 Nebraska to end their lengthy losing streak in the series. The 1939 game was televised in Manhattan, making it the second televised college football game. The 1992 contest was held in Tokyo, as the Coca-Cola Classic. The Cornhuskers' rivalry with Texas is known more for the tension between the two teams rather than number of games played. The teams have met 14 times, with the series dating back to 1933, a 26–0 Nebraska win. Texas leads the series 10–4. Since Nebraska's move to the Big Ten in 2011, the series has been dormant, with no future games having been scheduled. In the first-ever Big 12 Championship game, unranked Texas upset heavily favored Nebraska after the Cornhuskers, looking to win a third straight national championship, blew a fourth quarter lead to Priest Holmes and the Longhorns. The 2009 Big 12 Championship Game featured one of the most controversial ending in recent college football history. Late in the game, with no. 19 Nebraska holding a surprising 12–10 lead over no. 2 Texas, Longhorns quarterback Colt McCoy threw a pass out of bounds and the clock expired. After a lengthy review, one second added back onto the game clock, allowing Texas to kick the game-winning field goal. 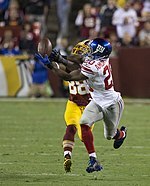 While there did appear to be remaining time when the ball hit the ground, the call was criticized by fans and media under the premise that no calls of that nature had been previously reviewed during the game. Nebraska and Miami are two of the biggest "bowl rivals" in college football, matching up in many memorable bowl games over the years. The teams have met 12 times, with the series dating back to 1951, a 19–7 Miami win. The series is tied 6–6. No future games have been scheduled. The rivalry's most notable game is also one of college football's all-time greats. In the 1984 Orange Bowl, Nebraska scored with seconds remaining to make the game 31–30. NU head coach Tom Osborne opted to try for a two-point conversion instead of an extra point, even though a tie would have given Nebraska the national championship. Miami won the game and its first national title. As of December 2017, with the hiring of head coach Scott Frost, the Nebraska Cornhuskers employ the following staff. Nebraska boasts 24 inductees into the College Football Hall of Fame. † Rodgers permitted his no. 20 jersey number to be worn by his son Terry, who played for Nebraska from 1986–90. 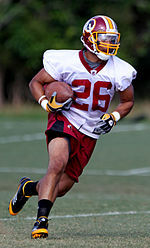 Marlon Lucky also wore this number before changing to no. 5. Michael Booker wore no. 20 for his entire career. Nebraska has retired the jerseys of 17 players. Since 1914, Nebraska has produced 96 players who have collected a total of 110 First-Team All-American awards. Nebraska claims 47 consensus All-Americans who have won a total of 56 consensus All-American honors and 20 unanimous All-Americans who have won 21 unanimous awards. Nebraska leads the nation in Academic All-America selections, both in football and across all sports. Nebraska boasts 70 CoSIDA First Team and 108 overall Academic All-America selections, both tops in the nation. The list includes 15 Huskers that have been named first team Academic All-American twice in their careers. The Huskers also lead the nation with a total of 330 Academic All-Americans across all sports. Nebraska has four players that have been selected as a First Team Academic All-American by entities other than CoSIDA: Don Fricke (1960), Pat Clare (1960), Jim Osberg (1965), and Tony Jeter (1965). As selected by Athlon Sports in 2010. There are 28 Huskers currently on NFL rosters as of February 4, 2019. All–Time Series Records vs. Current FBS opponents through the conclusion of the 2017 season. Updated with results through the current 2018 season. Announced schedules as of August 29, 2018. Wikimedia Commons has media related to Nebraska Cornhuskers football. ^ "2018 Nebraska Game Notes" (PDF). University of Nebraska. Retrieved August 28, 2018. ^ Husker Football First-Team All-Americans – Huskers.com – Nebraska Athletics Official Web Site. Huskers.com. Retrieved on April 12, 2014. ^ "University of Nebraska Athletics Brand Guide" (PDF). Retrieved December 24, 2017. ^ "Best college football teams of all-time". Retrieved October 6, 2018. ^ "Nebraska Conference Championships". Retrieved October 23, 2016. ^ "Title teams -- HuskerMax™". Retrieved October 23, 2016. ^ "Nebraska Football Schedules 1910–1919". HuskerMax. Retrieved September 2, 2010. ^ "Major Football Award Winners". Huskers.com. Retrieved June 21, 2010. ^ Fricke, Mark (2005). Nebraska Cornhusker Football. Arcadia Publishing. p. 17. Archived from the original on October 26, 2016. ^ McHugh, Jolene (November 19, 2011). "From the archives: The Cornhuskers". omaha.com. Archived from the original on October 26, 2016. Retrieved October 26, 2016. ^ Fricke, Mark. "Nebraska Football In The 1890s" (PDF). library.la84.org. p. 11. Archived from the original (PDF) on October 26, 2016. Retrieved October 26, 2016. ^ Christopherson, Brian (June 20, 2009). "Deep Red: The story behind the name 'Cornhuskers'". journalstar.com. Archived from the original on October 26, 2016. Retrieved October 26, 2016. ^ "Origin of the Cornhusker Nickname – Huskers.com – Nebraska Athletics Official Web Site". Huskers.com. Retrieved December 4, 2015. ^ "Husker Football History" (PDF). Huskers.com. Retrieved June 21, 2010. ^ "Pederson fired; Nebraska chancellor cites lack of football progress". ESPN.com. Retrieved June 21, 2010. ^ Sherman, Mitch. "Nebraska fires coach Bo Pelini". ESPN.com. Retrieved November 30, 2014. ^ a b Christopherson, Brian; Sipple, Steven M. (November 30, 2014). "Pelini fired as Husker head coach". Lincoln Journal Star. Retrieved November 30, 2014. ^ Mitch Sherman (December 4, 2014). "Nebraska hires Mike Riley as coach". ESPN. Retrieved December 4, 2014. ^ "Homecoming: Frost leaves UCF for Nebraska". Retrieved August 9, 2018. ^ a b c d "2018 Football Media Guide" (PDF). huskers.com. Husker Athletics. Retrieved August 9, 2018. ^ "Recruiting Tool: Osborne Names Himself Interim Coach". Washington Post. Retrieved August 31, 2018. ^ "Nebraska updates coaching web site with Trent Bray as interim head coach, no other assistants listed". Omaha World Herald. Retrieved October 8, 2018. ^ Christopher J. Walsh (2007). Who's #1? : 100-Plus Years of Controversial National Champions in College Football. Taylor Trade Pub. p. 47. ISBN 978-1-58979-337-8. ^ "History of Nebraska Football National Championship Season Reviews" (PDF). huskers.com. Nebraska Athletics. pp. 67–71. Retrieved September 17, 2018. ^ 2018 NCAA Football Bowl Subdivision Records (PDF). Indianapolis: National Collegiate Athletic Association. August 2018. Retrieved September 9, 2018. ^ "Nebraska All National Championships". Retrieved October 23, 2016. ^ "2018 Media Guide" (PDF). soonersports.com. Oklahoma Athletics. p. 6. Retrieved November 1, 2018. ^ "Bowl Tradition" (PDF). Husker Athletics. Retrieved August 9, 2018. ^ "Nebraska's Bowl History". Retrieved August 9, 2018. ^ Athletics, Nebraska. "#RedRising". Retrieved October 23, 2016. ^ "Huskers to Celebrate 300th Consecutive Sellout with 1962 Throwback Uniforms". Huskers.com. Retrieved September 26, 2010. ^ "Nebraska vs. Missouri 1962". HuskerMax. Retrieved September 26, 2010. ^ "Husker Legacy Statue". Huskers.com. ^ "Osborne says no one deserves statue more than Devaney". Omaha World Herald. Archived from the original on September 4, 2013. Retrieved August 9, 2018. ^ "Upon Further Review, There Will Be Balloons". Huskers.com. September 12, 2012. Retrieved August 9, 2018. ^ "History of the Blackshirts". Huskers.com. Retrieved June 21, 2010. ^ "Helium Shortage Puts Touchdown Balloons on Hiatus". Huskers.com. August 13, 2012. Retrieved August 9, 2018. ^ "Walk Ons: Huskers' Edge". Nebraska Educational Telecommunications. Retrieved June 20, 2013. ^ Layden, Tim (January 15, 1996). "Headed For A Fall?". Sports Illustrated. Retrieved June 20, 2013. ^ "Graeber Generosity Helps Walk-On Program". Randy York's N-Sider Blog. Nebraska Huskers. May 3, 2013. Retrieved June 20, 2013. ^ Siddiqui, Faiz (December 31, 2012). "Walked off: Not every Husker walk-on has success, or even the 'Rudy' moment". Lincoln Journal-Star. Retrieved June 20, 2013. ^ "Football – Walk-ons". thisisnebraska.com. Nebraska Huskers. Retrieved June 20, 2013. ^ "Huskers' Historic 1959 Upset of Oklahoma Was Greatest One Ever". Retrieved October 23, 2016. ^ "Football - Coaches - Nebraska Huskers". www.huskers.com. ^ "College Football Hall of Fame". Retrieved August 9, 2018. ^ "Nebraska's Retired Jerseys". Retrieved February 21, 2018. ^ "1914 Big Eight Conference Football season standings". Bigeightsports.com. Retrieved April 22, 2013. ^ "1915 Big Eight Conference Football season standings". Bigeightsports.com. Retrieved April 22, 2013. ^ "1924 Big Eight Conference Football season standings". Bigeightsports.com. Retrieved April 22, 2013. ^ "1925 Big Eight Conference Football season standings". Bigeightsports.com. Retrieved April 22, 2013. ^ "Weber Named First-Team Academic All-American". Retrieved August 9, 2018. ^ "Nebraska's All-Time Team". Athlon Sports. Retrieved June 21, 2010. ^ "Pro Football Hall of Fame". Retrieved June 7, 2012. ^ "PFHOF William Roy (Link) Lyman". Retrieved June 7, 2012. ^ "PFHOF Guy Chamberlin". Retrieved June 7, 2012. ^ "PFHOF Bob Brown". Retrieved June 7, 2012. ^ "PFHOF Will Shields". Retrieved January 31, 2015. ^ "PFHOF Mick Tingelhoff". Retrieved January 31, 2015. ^ "Huskers In The NFL". Retrieved September 28, 2018. ^ "Annual Series Records 1890–2017" (PDF). Retrieved August 28, 2018. ^ "Nebraska 2018 Football Schedule/Results". Retrieved October 8, 2018. ^ "Huskers Add Six Games to Future Football Schedules". ^ FBSchedules.com, Nebraska Cornhuskers Football Schedules and Future Schedules. Retrieved August 27, 2014. ^ Huskers Website, . Retrieved June 6, 2015. ^ "Big Ten Schedules 2022-2025". Retrieved August 29, 2018.